In its Switzerland branch EdilBi Suisse, multisectoral global services company EdilBi commissioned interior designer Fabio Gianoli to create two new office tables for a renowned pharmaceutical company with headquarters in Switzerland. The material selected for these designs was the solid surface from PORCELANOSA Group, KRION, due to being a thermocurvable material that can be adapted to any design that we can imagine. The most striking design is the meeting room table. As designer Fabio Gianoli tells us, “it was more than a challenge; an experiment”. The harmonious form of the table conveys a sensation of lightness, simplicity and elegance, created thanks to a long and laborious process of moulds and thermoforming, then affixed with the specific adhesive for sheets of KRION1100 Snow White to create a unique shape, 5 metres long by 1.6 metres in its widest section, without perceptible joins. Its resistance to breaking from heavy loads is guaranteed thanks to an iron frame located inside the table and fixed to the floor. 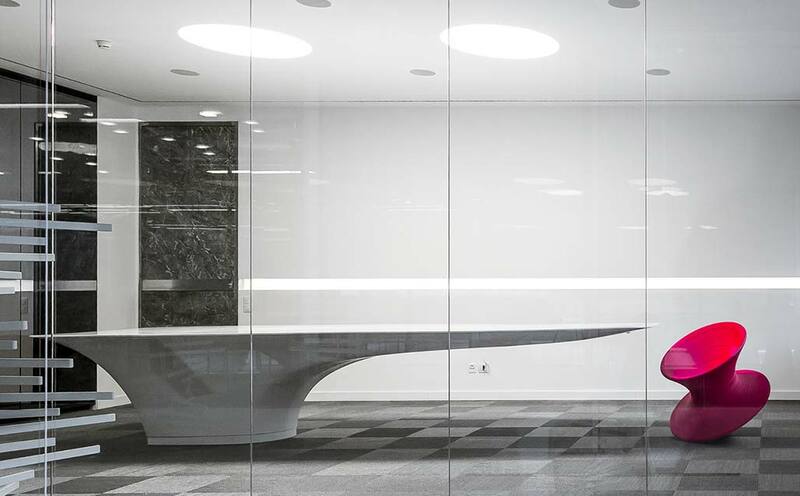 In the office of the director, the table has a sculpted, monolithic form, angled on all sides. EdilBi Suisse and Fabio Gianoli also selected KRION for this spectacular table.